Falling oil prices have hit Canadian oil firms hard in the last year, with many struggling to keep their heads above water. However, innovative financing methods, greater understanding by both lenders and regulators, and more long-term focus are providing hope that the future will be brighter. 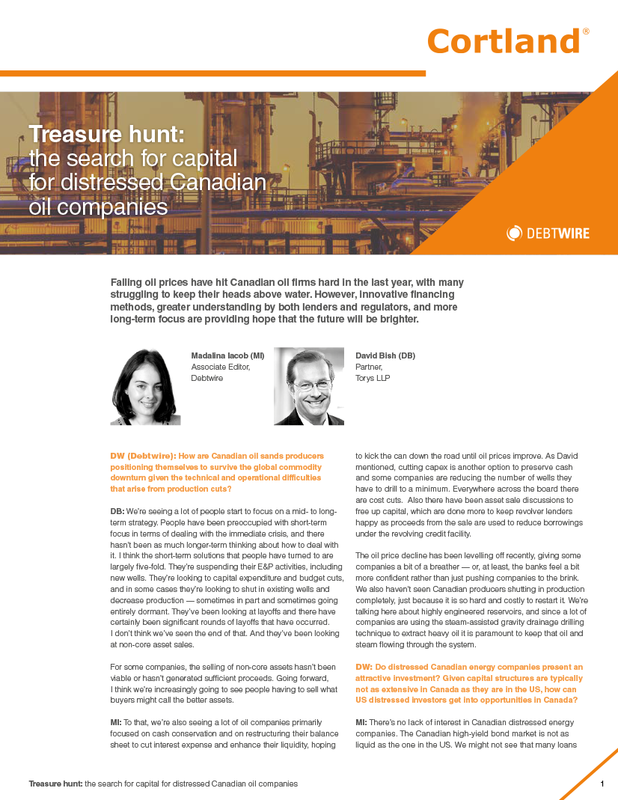 Debtwire, on behalf of Cortland Capital interviewed two experts to discuss the key issues and trends to watch as Canadian oil companies deal with distress. What do the next 12 months hold for Canadian energy credits and investors? How much of this depends on the result of the Redwater Energy case? How long will banks/lenders continue to be lenient with companies they are lending to? When will they take action by cutting credit lines or putting CROs in place? What options are available to debt-burdened energy companies in Canada with debt financing becoming increasingly challenging?